A dash of gourmet panache. Those with refined tastes will appreciate this extraordinary offering of our finest gourmet foods delivered within an attractive handled fabric keepsake basket. Gourmet gifts are always a welcome addition to any occasion. Birthday, I love you and more. You can never go wrong with specialty gourmet foods. This gift basket includes the following: Macadams' Lemon Tea Cookies 2 oz, Macadams' Island Mix 2 oz, Dolcetto Chocolate Wafers 3 oz, Snickerdoodle Cookies 2 oz, Lemon Raspberry Cookies 3 oz, Aaron Bell Pretzels 4 oz, Sweet Hot Stone Ground Mustard 3.25 oz, Mini Chocolate Chip Cookies 4 oz, Toffee Peanuts 2 oz, Almond Roca 1.64 oz, Almond Crunch Popcorn 4 oz, Biscotti 1.62 oz, Vanilla Creme Caramels 2 oz, Aaron Bell Almonds 1.5 oz. If any substitutions are necessary, they will be made with items of equal or greater value. Measures 13" x 9" x 8". 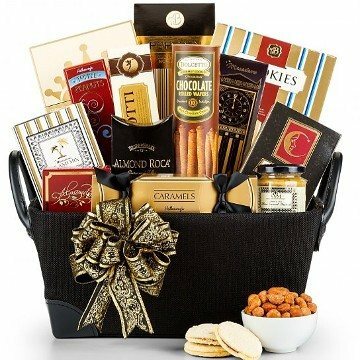 The Elegant Offering Gourmet Gift Basket has been purchased most frequently by our customers for the following occasions: Christmas, Thank You, Sympathy, Corporate, and Birthday.